Want to try your luck and know how much it favors you? Amazon Quiz time is a way to do it. 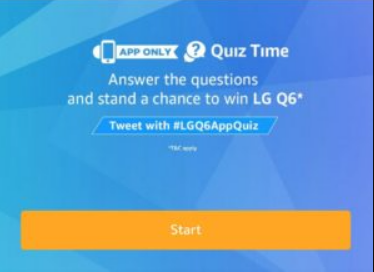 Every week Amazon organizes a simple Quiz and users can participate and be able stand a chance to win a LG Q56. Answer now and try your luck !! 2. Open the app and you will see a banner about the Amazon Quiz Time Contest. Click on it. Q1. Which of these is the technology in LG Q6 Display? Q2. Every LG Q6 bought on amazon.in comes with a free one-time screen replacement valid for the period of 6 months? Q3. What is the aspect relation of the LG Q6 full vision display? Q4. Which of these was named international word of the year 2013 by theOxfordd dictionary? Q5. Which of these is the features of the LG Q6 front camera? 6. 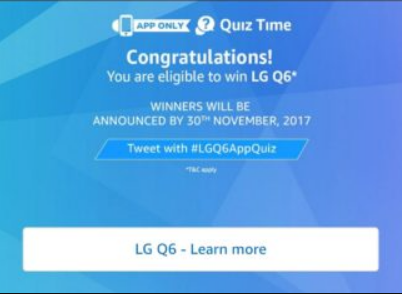 The declared winner(s) will be eligible for winning a LG Q6 Mobile Phone each (hereinafter referred to as “Prize(s)”).